The JCM (NC) Standing Committee meeting under the Chairmanship of Secretary, Department of Personnel was held on 25.10.2016. All agenda items were discussed. 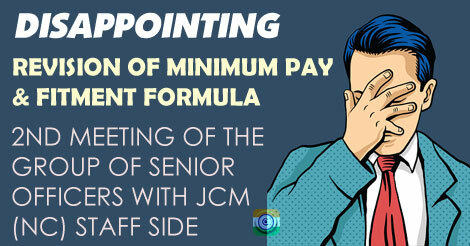 Some of the items are - JCM functioning, Compassionate appointments, amendment to the definition of anomaly, Changing MACP conditions, Ex-Servicemen pay fixation, Pay fixation option on promotion after the date of notification of CCS (RP) Rules 2016, GDS bonus enhancement to 7000/-, casual labour regularization and bonus enhancement, filling up of vacancies, upgradation of LDCs to UDCs, one time relaxation of LTC-80 availed by air by purchasing tickets from other than authorized agents, Restoration of Festival Advance, Natural Calamity Advance and Advance of leave salary, grant of entry pay recommended by 6th CPC to the promotes, reimbursement of actual medical expenditure incurred by the employees in a recognised hospital etc. Decision: The anomalies in the fixation of pay of re-employed Ex-Servicemen is under consideration of DOP&T. Decision: This issue would be considered by the Implementation Cell of 7th CPC. Decision: Revision of Bonus ceiling for GDS and Casual Labourers would be considered by Department of Expenditure. Decision: Since there is no ban on recruitment, vacancies can be filled up. Instructions in this regard will be issued once again. Decision: - The Judgment of Chennai CAT and Principal Bench New Delhi would be examined by DOP&T and Department of Expenditure. Decision: A separate meeting would be held by the Health Ministry with the staff side to discuss this demand.